Cyber Tech Cafe would like to wish everyone a Happy Thanksgiving! 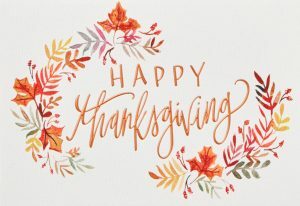 We will be closed on Thursday, 22 November 2018 and Friday, 23 November 2018 to celebrate the Thanksgiving holiday with family and friends. Any non-emergency support requests will be responded to on a first come, first served basis on Monday, 26 November 2018. If you need emergency technical support Thursday thru Sunday, our emergency on-call technicians will be available. You can page the emergency on-call technician by including the word ’emergency’ in the subject of your email request. Please note the holiday rate will apply. From all of us here at Cyber Tech Cafe, we wish you and yours a Happy Thanksgiving!